However, Vodafone Netherlands has stepped up the potential of the medium, by launching a modern day variant of the playground classic ‘tag’ for the Google/OHA (Open Handset Alliance) Android platform. 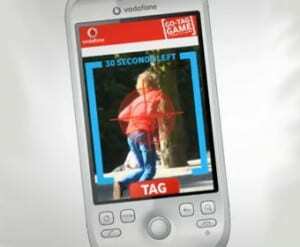 In conjunction with creative agency Marvellous, Vodafone introduced a game where players can ‘tag’ each other using the HTC Magic phone via the camera and a specialised app. The Go Tag app allowed players to ‘tag’ their rivals by using image recognition technology to identify the target’s shirt colour when a picture was taken. Devices like the Android HTC Magic and the iPhone 3GS are expected to pave the way for augmented reality applications, mainly because these devices are equipped with a digital compass that complements the GPS functions on the handsets. San Francisco review site Yelp recently launched an iPhone application featuring a setting that allows consumers to use their handset’s camera to bring up information, such as reviews, about various restaurants as the lens scans over the buildings.